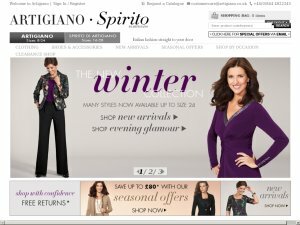 Artigiano Specialise in Plus Size & Regular Size High Quality Italian Style Clothing. For All Your Plus Size Clothing Needs & Italian Designer wear visit Artigiano. Offer condition: Free Delivery when you spend £80 or more applies to orders placed online at www.artigiano.co.uk and excludes delivery charges. To redeem the offer, enter the promotion code where prompted at checkout. Offer is not valid in conjunction with any other promotion or discount and only one code may be used per transaction. Artigiano reserves the right to cancel or amend this promotion at any time without prior notice. Do not miss another Artigiano voucher! Simply leave your e-mail address and we'll always keep you informed of new vouchers for Artigiano. Offer condition: Excludes delivery charges. To redeem the offer, enter the promotion code where prompted at checkout. Offer is not valid in conjunction with any other promotion or discount and only one code may be used per transaction. Artigiano reserves the right to cancel or amend this promotion at any time without prior notice. Offer condition: Cannot be used in conjunction with any other offer. Offer condition: T&C - £10 off orders over £100 applies to orders placed online. Offer excludes Gift cards, sale items & delivery charges. To redeem this offer, enter the promotion code where prompted at checkout. Offer is not valid in conjunction with any other promotion or discount and only one code may be used per transaction. Artigiano reserves the right to cancel or amend this promotion at any time without prior notice. Offer condition: To redeem the offer, enter the promotion code where prompted at checkout. Offer is not valid in conjunction with any other promotion or discount and only one code may be used per transaction. Artigiano reserves the right to cancel or amend this promotion at any time without prior notice. Offer condition: Your free delivery offer is for free standard UK postage worth £4.95 only. Oversized or heavy items may incurr additional charges. To redeem the offer, enter the promotion code where prompted at checkout. Offer is not valid in conjunction with any other promotion or discount and only one code may be used per transaction. Artigiano reserves the right to cancel or amend this promotion at any time without prior notice. Offer condition: Your free delivery offer is for free standard UK postage worth £4.95 only. Oversized or heavy items may incur additional charges. To redeem the offer, enter the promotion code where prompted at checkout. Offer is not valid in conjunction with any other promotion or discount and only one code may be used per transaction. Artigiano reserves the right to cancel or amend this promotion at any time without prior notice. Offer condition: Your free delivery offer is for free standard UK postage worth £4.95 only. Oversized or heavy items may incur additional charges. Latest voucher code valid at a time of promo publication was entered to be working from 2017-06-02. GetGeared - Gear for Bikers!